The day dawned sunny, and humid with a chance of rain. Although I had washed and waxed the A4 a couple days before, there were still a few things to take care of. This was my first Motorstadt, but the last for the A4, as my new’10 GTI had reached port just a few days prior. As I washed the sill plates and did the final detailing, I thought about the last 10 years with the A4, but looked forward to meeting new friends and talking to people about their new GTI’s. I left the house a bit late, but remembered to bring lots of water- it was already getting hot. Motorstadt was in a new place this year, The Austrian Society Park, which fortunately had some markers near the entrance since I would have driven right past the first time. After my registration was confirmed, I drove up the narrow one lane road though the woods which opened up into a huge park. 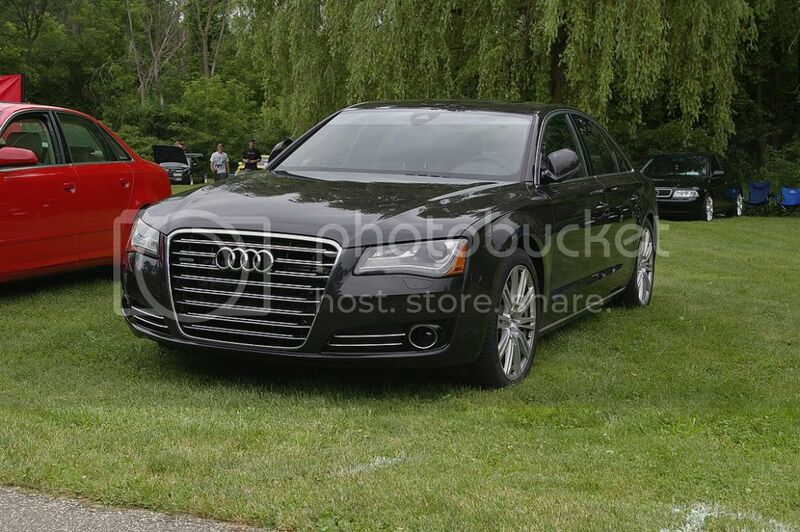 I parked in the B5 area in front of the surrounding woods, next to Francois’s red and white ’57 Audi. The Audi area was cozy. 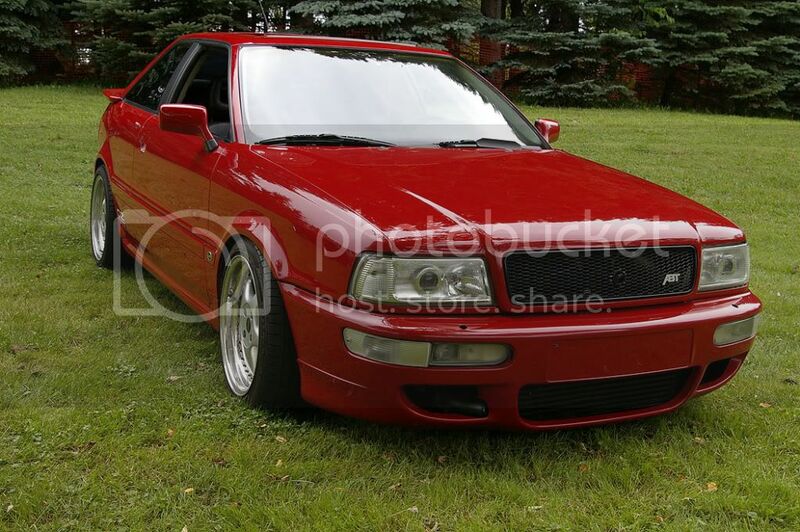 As I expected, most of the Audi representation was from B5 A4’s with a few other gens thrown in. The A4 parking was across the drive from the TT’s, Coupe Quattros, and S6’s. Francois’s S2 and Ed’s CQ parked next to each other contrasted the many ways people modify their cars. Francois’s discrete CQ with it’s powerful engine, and Ed’s track attack, stripped out interior, fat tire toy. There was no pearl white V8 representation this year due to an unfortunate incident involving the Detroit Police, loud exhaust noises, sparks, and possibly an unconfirmed fuel leak. This years show had for the first time a dedicated race car display with the awesome rally UrQs from Tim Maskus and Curt. 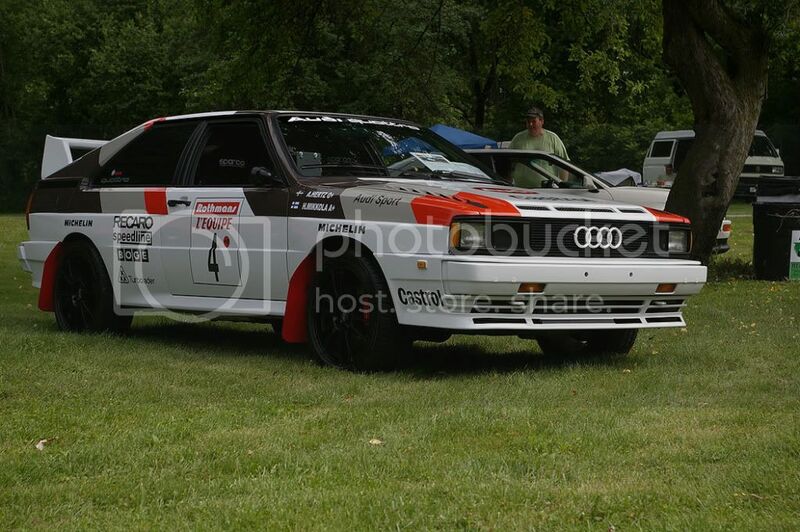 Tailored from northern Michigan, these two cars parked with a few other choice rally brands from Francois, showed the spectators what Quattro was originally engineered for- going fast over any road condition. One of the nicest features of the park is its nice shaded picnic area. Located right in the middle, this area had a concession stand with reasonably priced food and drink from Lori, a longtime MIVE (Michigan Volkswagen Enthusiast) club member. A few vendors were there as well such as Lacks Enterprises and Bissel Vacuums. Both of these vendors invited people to take a survey on future products. Lack’s survey was a showcase of different wheel finishes, from plain silver paint and chrome to their new black chrome finish. Next to the new black chrome (Jeff loved these wheels), the regular chrome finish looked a bit dated, at least that’s how I see it (Ken- Actually I saw this survey as a way to tell them how ugly chrome wheels are- are you listening GM?) After the survey they gave us a nice little free first aid kit. It will come in handy since Michelle is always hurting herself- don’t tell her I told you. Locktite also had a booth to show off some of their new products and were giving demonstrations. Jeff especially liked the Freeze and Release product, which would have come in handy for the Miata and Subaru. I won’t need it for a while on the new GTI, although there’s still my old Miata. 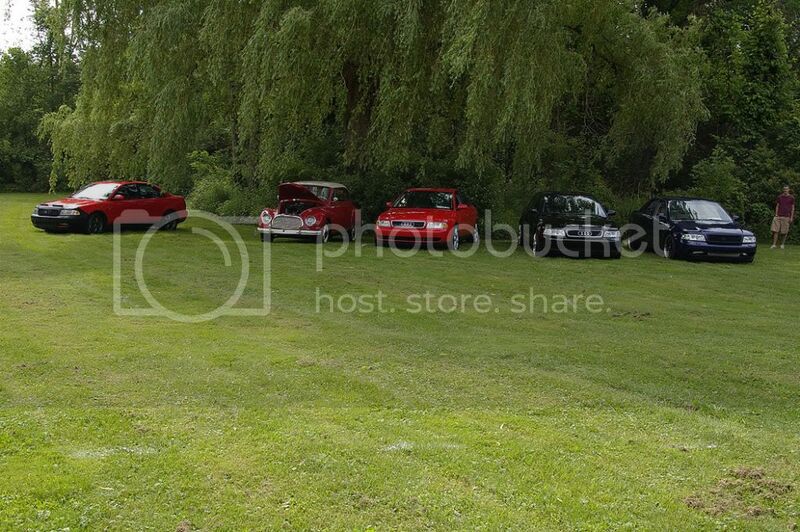 As you’d expect, the VW turnout was huge. 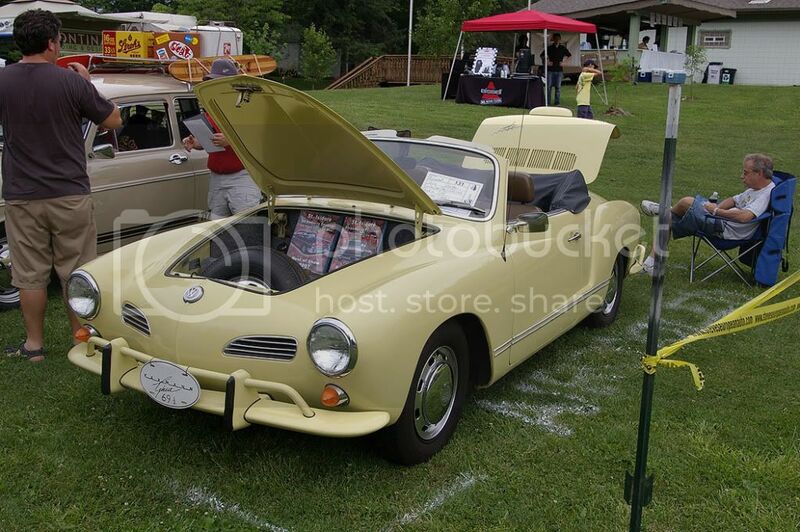 All generations were represented from Karmann Ghias, all the way to Stephans’s Passats. 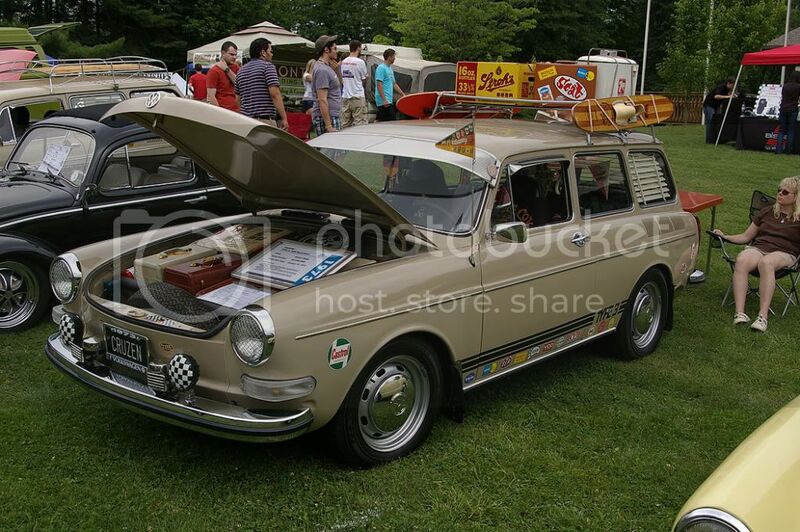 Fresard VW was there with a CC and a 4 door Golf TDI 6 speed stick(! 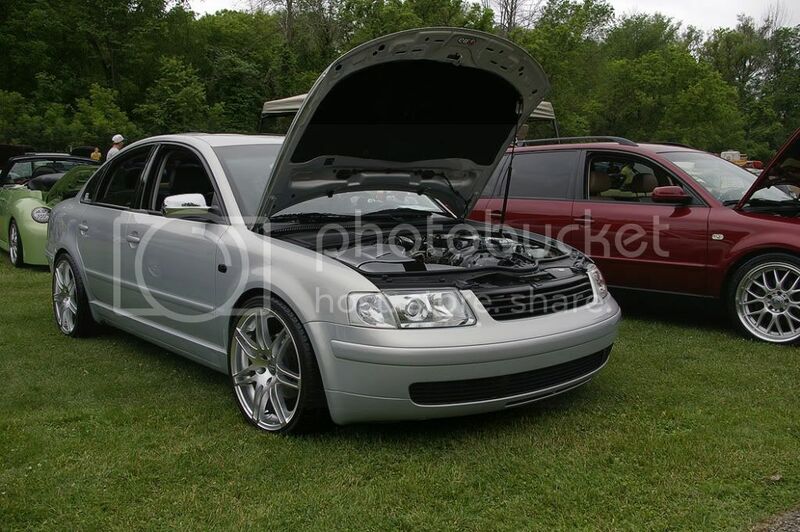 )- United Grey like my car and a trailer full of VW goodies for sale. Wandering through the VW ranks, I really got a sense of the VW ownership taking individuality to the extreme. 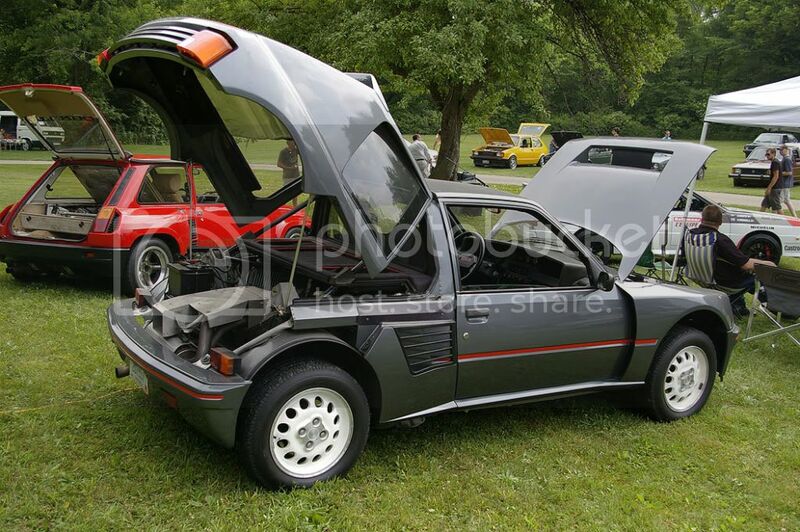 Examples of this was the MkIII Jetta with every panel a different color, or the VW Cabrio painted up in desert camo (Jeff- tastefully done I might add), and the winning best in show R32 with its blended widebody panels, supercharged engine and orange pearl paint. Some of the cars were stock, others like the R32 were modded to the extreme but most were in between, and all-in-all tasteful. I was a little disappointed not to see a Thing though. As I walked toward the many MkV GTI’s, I saw a Fahrenheit Edition Orange GTI that looked a lot like the one I see parked at the end of my street. Sure enough it was, and I met the owner, Joe (cue It’s a Small World song). I asked Joe if it was normal to have bought my first mod before taking delivery of my GTI, I have had an OEM golf ball shift knob/ boot assembly collecting dust under the couch for the last 2 months- what can I say, for $30 shipped from ECS how could I go wrong? Joe assured me it was normal- he had new wheels and tires in his garage two months before getting his GTI. Moving on to the the MkVI’s, I caught up with Dan who had just bought his Carbon Steel Grey 4 door DSG. Despite having less than 2,000 miles, he had already chipped it with the APR program good for 250hp and 300 lb*ft of torque. 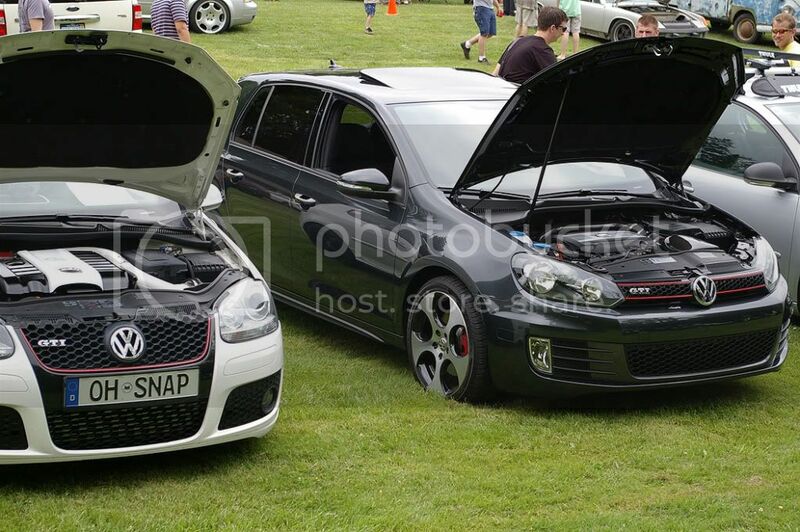 He previously had a 2 door MKV GTI that was also chipped. He implored me to chip mine as soon as I get it, but I think I’ll wait awhile. My first mod (besides the shift knob) will be to swap out the crappy all season tires the car comes with to something more performance oriented, albeit still all seasons for now. After grabbing a bit of lunch, I sat down at the rally display tent Francois, Kurt, and Tim had erected to watch some vintage rally videos they brought to share with everyone. After lunch I got a call from Dan Simon who was swinging by with his kids and a new, yet to be released, 2011 A8 4.2. The car was striking and the front grill seemed to make as many disbelievers as it did believers. As expected, the interior was impeccable, but the exterior was very evolutionary which can be said of just about every Audi redesign. How cool would it be to display an evolution of Audi design from Francois’s vintage’57, his swinging 70’s coupe, into the Coupe Quattros, 4000, 5000, 80, 90, and onto the 4 generations of A4’s? At the end of the day, there was a raffle where I won a Locktite repair kit with thread locker, sealers, and some super emergency tape. A few of our of MCA friends won awards including Sephan who won two in the Passat category, Francois once again took the prize for the ‘Audi Other’ class with his ’57 Audi, and Kurt and Tim both won awards for their rally cars including Tim’s ‘All Go’ award. He deserved it since we don’t think there was a bigger turbo on any other car in the county. All said and done, although hot and humid, the day turned out to be great and the rain never showed its ugly mug. The park was nice, the people were great, and there were too many cars to shake a stick at. Plus after the show Lori was selling hot dogs 2 for $1! Oh, I also got a few possible buyers for the A4, although it looks like my neighbor is going to buy it. I’m not sure I want it that close. Not for the reasons you may be thinking, but rather because I wonder if I’ll look back and regret the decision to sell it. On the other hand, gripping the GTI’s flat bottom steering wheel and winding out the 2.0T, I may not. Continue the discussion about Motorstadt 7 in our forum thread. Forums Take me to the forums!